Keith, I saw one at Timetrend in Megamall. Would be a nice addition to your Oris collection. I was looking for white or silver dials, but it caught my eye. 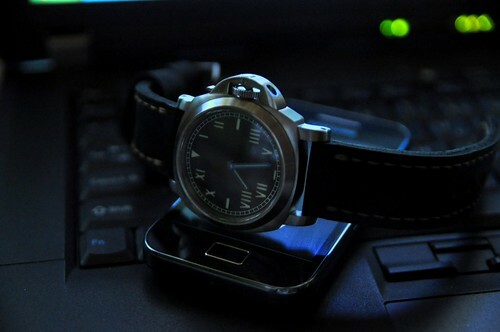 Should be with typical Oris discount. I have one of these. It makes Panerais look puny. Looks great on my handlebar though. Nice one Dong!! size 44 mm? What's the mechanism ? I have one of these. It makes Panerais look puny. nice, mojazz. have the same watch on my wrist now, black dial. cost is less than some straps. i wish they had one with a white dial though. was thinking of replacing the straps with a brown one. I'll go looking for a nice strap. This is a good casual for weekends watch. too bad its not waterproof. water resistant lang. closest would be cream. they also have the same model in blue. 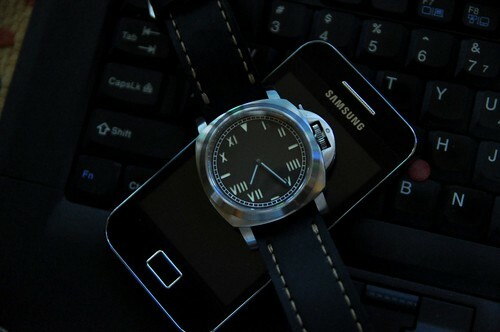 MoJAZZ wrote: i wish they had one with a white dial though. was thinking of replacing the straps with a brown one. I'll go looking for a nice strap. This is a good casual for weekends watch. too bad its not waterproof. water resistant lang. Raul, merong puti sa ibang AD. Use NATO or Zulu straps. onedown, hanap nga ako ng white dial...bah merong blue? bagay sa maong! this could be the start of a colored collection of this watch. Could not read how many bars water resistant sya. I need new glasses! sabi sa manual if 3 bars daw hugas kamay lang puede, if 5 bars peude daw ilangoy (este i-swim). Dong, saan meron NATO or Zulu straps? yup it comes in blue. if you decide to get all four colors--black, green, blue, and cream, it wouldn't cause a big dent on the pocket. the watch has 18mm lugs. if you're registered at philippine watch club, try ditoy_eagle. you can also try epoy, though he might not have 18mms in stock. also try the seiko shop at glorietta. saw about three pieces there, though that was months ago. re 5-bar water resist, i wouldn't recommend wearing a 5-bar water resist watch while swimming. the specs were tested in the lab, and the tests doesn't factor in arm movement underwater, which can increase pressure. better to err on the safe side. our watch is 3-bar water resist, good enough for accidental contact with water like rain. A Stunning and Very Popular Watch Introducing the Seiko 5 Military Collection. 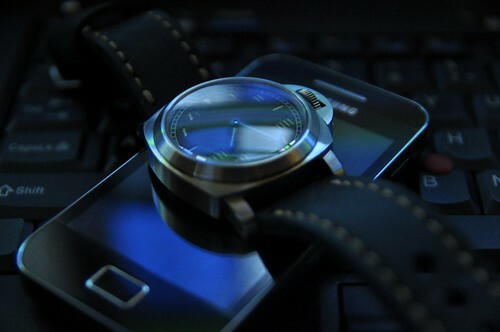 Brushed and polished stainless steel case (38mm diameter 11mm thick). Unique and suitable tan dial with luminous black hands and hour markers. Day and date display. Precisely calibrated selfwinding 21 jewels Japanese automatic movement. See through case back. Crafted scratch resistant Hardlex crystal. Tan nylon strap with a comfortable fitting buckle. Water resistant up to 30 meters. Now this is getting interesting! 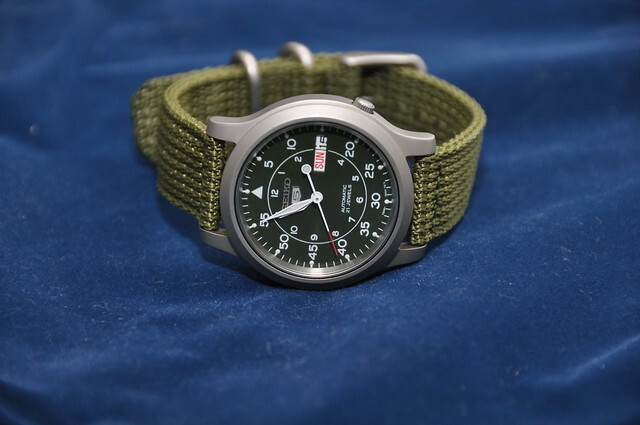 A 44mm military watch from Seiko? Black dial with flat Hardlex glass. i think it's slightly smaller at 42mm. available colors are same as the one our seiko, which by the way is nicknamed "flieger."